It’s been some time since I “reviewed” something for my peers. I’d say that’s partially because my tastes in musical gear tend to be a little eclectic but also because I get so busy making music that talking about it sometimes seems tedious to me. I feel, however, that this unit deserves a review. I found myself in need of a piece of equipment that could handle my effects processing, preset management and rig control. I had previously owned an Axe FX Ultra and while that unit sounded great, I found it a bit difficult to work with. After much deliberating, I settled on the Line 6 Helix, based on hours of research and recommendations from several trusted friends who also play. I’m going to break it down into five categories: Sound, Build Quality, Ease Of Use, Flexibilty and Price. These are the 5 most important factors for me when looking for a high tech piece of gear like this. The short answer is that the Helix sounds great. Even more, it feels great. Part of the magic of tube amplifiers is the way they react to the pick attack, your volume control and the complex dynamic content. The Helix captures that in spades. While you might argue something like the Kemper is more “accurate” to a specific amp, all of the Helix models do an excellent job of capturing the unique spirit of the amplifiers they are based on. My favorite part is that all of the amp models in the Helix feature “Preamp” versions, meant to run into the power amp of your choice. Its a great middle ground to capture the personality of amps that you like, while still keeping a consistent base for your tonal pallet. My favorite models are of a Fender Twin, Marshall JCM800 and PRS Archon. Its worth mentioning as well how great the effects sound. The Helix features stellar reproductions of a plethora of guitar(and studio) effects that are all extremely easy to work with. This floor unit is built like a tank. The solid metal case is both sturdy and heavy, making it feel like the worlds most beautifully integrated pedal board. The expression control has a very durable grip surface and is solid as a rock. It also uses a standard amp style power cable, eliminating the worry of a specialty power adapter going out on you at a gig leaving you without your rig’s “brain”. I’m not particularly rough on my gear, but I also don’t baby it. I play mostly in rock and metal bands and I feel extremely confident in the unit’s durability during live performances. This is without a doubt my favorite part of the Helix. I come from a background of analog amps and effects so I find most digital units a real pain to deal with and uninspiring for that reason alone. The Helix solves that problem entirely by making everything extremely easy to navigate. The large, backlit LED screen is easy to read from several feet away and the row of physical knobs underneath the screen correspond to parameters directly above them. Anyone that can turn the knobs on an amp or an old school effect pedal can handle this unit with no problem and no prior instructions. Even better, the Helix can be edited on your PC with a free piece of software from Line 6’s website using the unit’s USB connection. This allows you to fine tune presets easily without having to get down on the floor and opens up a world of options with presets, snapshots, impulse responses and more. To paraphrase Todd Howard from Bethesda Game Studios, “It just works”. You can certainly delve deep into the Helix’s massive feature set with further study, but it is a breeze to dial in a great sound with the most basic controls. you can imagine. Its very easy to run your own effect pedals in conjunction with the unit, run it with your amp in the “four cable” setup taking advantage of the FX loop on your amp, or running very convincing tones direct to the front of house or recording interface. 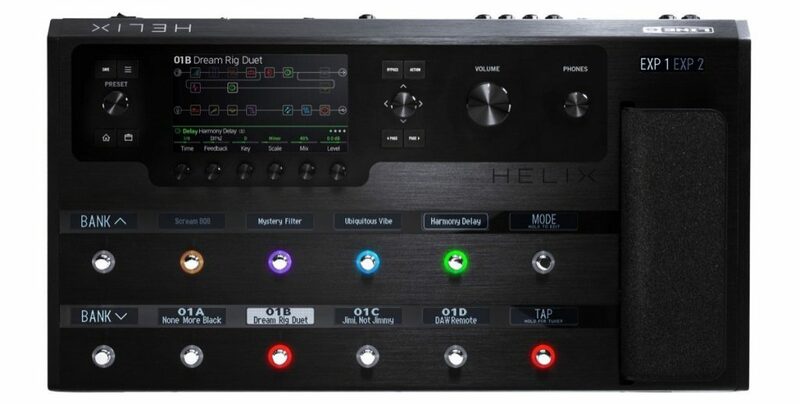 The Helix even has relay switching capability for your amp’s channels, midi functionality and additional inputs for more expression pedals should you desire them. Combine all those features with the impressive DSP horsepower inside and you get one hell of a swiss army knife. I won’t call this unit inexpensive, because that isn’t the case. However, $1500 new is extremely affordable for both the quality of sound and all the options it includes. To build a pedal board or rack system that would do half of what this unit does would cost significantly more and would be a cabling nightmare. Even the Axe FX II, Helix’s main competitor is nearly double the price new. I would argue that many seasoned players have spent much more in their pursuit of tone with amps, cabs and pedals and often still aren’t satisfied. I purchased my Helix gently used off Reverb for $1100 shipped to my doorstep. To wrap it all up, I give the Helix five stars, 10 out of 10 or two thumbs way up. I honestly can’t think of anything else I’d want the unit to be capable of. The only limit to what I’m able to do is my imagination.